StartOrganic is currently working with PayPal, Tesla, Intuit and other major corporations to provide on-campus gardening programs for employees. 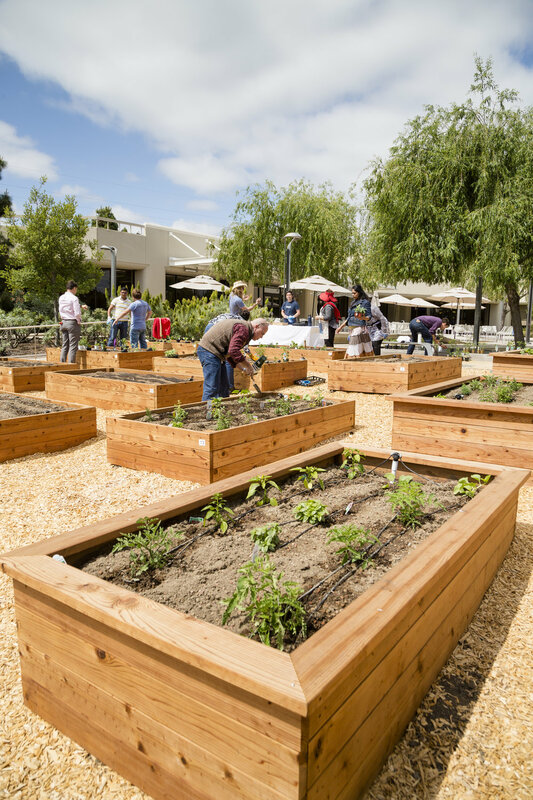 Introducing a vegetable garden on these corporate campuses has fundamentally changed the atmosphere. Employees are engaging stress-relieving and rewarding activities while hosting meetings serving organic produce. Our team manages every aspect of the program from consulting services for garden design to planning events in the garden. Typical programs include: weekly garden visits, monthly classes, and seasonal maintenance services. Click here to contact us about starting a corporate garden program at your company. Don’t have the space for an garden on campus (or just not ready to install one yet)? We’ll help you meet your company goals by teaching healthy eating, fun physical activity, mindfulness, relaxation, and a valuable life-skill with our organic gardening workshop series. StartOrganic continually partners with eBay, LinkedIn, Evernote, and More high profile companies to raise awareness and promote gardening. Workshops are always fun and extremely informative! Other examples include: Earth Day events, health fairs, and Lunch and Learn workshops. Meet with our team to discuss your goals as a company and how to best engage your employees with an organic garden. Physical placement and orientation of the garden are paramount to your growing success as well as creating the desired atmosphere. Each site offers unique advantages and challenges. Sunlight, soil quality, irrigation, pest identification, and plant selection vary with every location. Let our garden experts guide you through the right way to plan and execute your corporate garden.